Chris @Moorman1 draws lessons from a hand he played against a loose "maniac" in a recent event. In a hand review @888poker Ambassador Chris Moorman shows how a "maniac" can affect how a game plays. "When you get a crazy player at the table who is just sort of playing ridiculous ranges in every hand and ready to blow up, it does change the game." 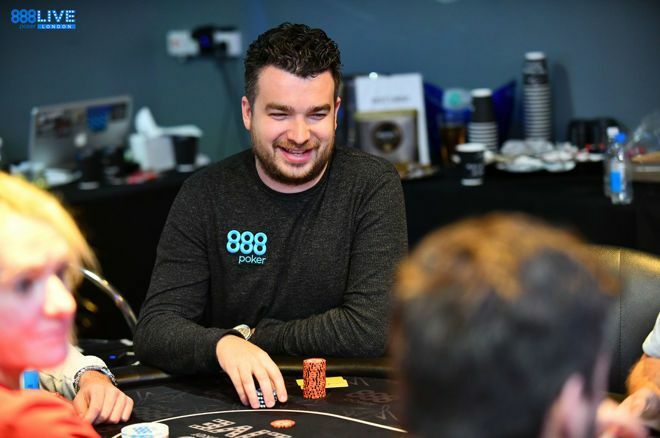 So explained Chris Moorman recently following an interesting hand he played in the 888poker LIVE Bucharest series versus an especially active opponent. As Moorman explains below, the player in the hand had already demonstrated an especially loose and aggressive playing style, having earlier three-bet from early position with just 3-2-suited over a UTG player's opening raise, then played a huge pot after flopping bottom pair. "But he was in every hand as well," Moorman continues. "When he was opening, he was opening for 5.5 times the big blind," proving the maniacal play was something of a pattern for him. Moorman recalls as well a hand in which after this player had opened Moorman three-bet with pocket nines, but had to let his hand go when a third player shoved — all of which further fueled the 888poker Ambassador's desire to get involved with the loose cannon. Then came a hand in which the player opened again and Moorman called with position holding . As he notes, he might have three-bet the hand, but knowing the opponent was unlikely to fold he just called. The big blind also called, and the three players saw a flop come . It checked to Moorman, and again while he might normally bet with his overcards and flush draw, he chose to check mainly because he expected his loose opponent would not be folding. The turn was a (not a diamond), and it checked around once more. The river then brought the , giving Moorman the second-nut flush, and after the small blind checked the loose player made a small bet. "I decided to go for some thin value, because I was like 'this guy's not going to fold any sort of flush, the way he's being playing," Moorman says. So he raised, the big blind folded, then the loose player shoved all in! When raising the river, Moorman says he already had a plan to fold should this exact situation happen and the loose player reraised all in. But he managed to talk himself into a call. As Moorman says, "sometimes the maniac has it." That's one lesson here. He goes on to explain how the hand also helps demonstrate how important it is not to overadjust too greatly one way or the other when a seemingly "crazy player" is at the table. the maniac makes others sometimes play more loose and aggressive themselves out of a desire to get involved in hands with the player. You could say Moorman actually demonstrates both of these tendencies in the same hand, having played tight through the turn thanks to being wary of his opponent's resistance to folding, then ultimately making what in retrospect he sees as a loose river call out of an eagerness to win the maniac's chips. "Handling Red-Light Runners: What to Do When Surrounded By Maniacs"
"Should You Play Poker with Maniacs or Find Another Game?" "Exploiting 'Maniacs' and 'Bridge Jumpers'"